Mojito is a traditional Cuban highball. A Mojito is traditionally made of five ingredients: white rum, sugar (traditionally sugar cane juice), lime, sparkling water and mint. The original Cuban recipe uses spearmint or "Yerba buena", a much lighter mint variety very popular in the island. Its combination of sweetness, refreshing citrus and mint flavors are intended to complement the potent kick of the rum, and have made this clear highball a popular summer drink. 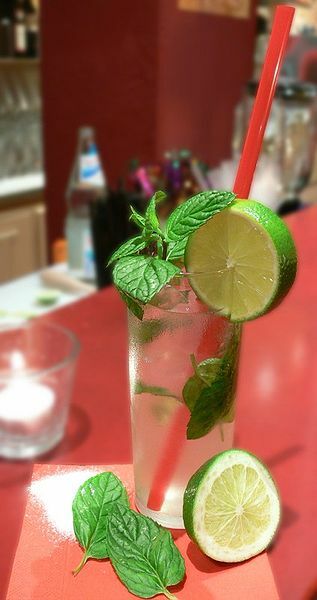 The mojito is one of the most famous rum-based highballs. The Mojito was a favorite drink of author Ernest Hemingway. There are several versions of the mojito. When preparing a Mojito, lime juice is added to sugar (or syrup) and mint leaves. The mixture is then gently mashed with a muddler. The mint leaves should only be bruised to release the essential oils and should not be shredded. Then rum is added and the mixture is briefly stirred to dissolve the sugar and to lift the mint sprigs up from the bottom for better presentation. Finally, the drink is topped with ice cubes and sparkling water. Mint leaves and lime wedges are used to garnish the glass. Serve in a highball glass, on the rocks; poured over ice, garnished with a mint sprig. Serve with a straw. Ernest Hemingway requested Mojitos without sugar. Of course, this suggests that less lime juice be used. Sometimes, the juiced lime is used as an additional garnish. Due to the trade embargo, Cuban rum cannot (legally) be purchased in the United States; American bars use other light rums. Vodka Revolution (a bar chain in England) make their mojitos by: crushing 3 tsp Demerara sugar, 8-10 fresh mint leaves, torn up and 8 sections of a lime cut into 1cm cubes, together in the base of a glass. Then adding half the ice, pouring in 25ml Havana Club Rum, 25 ml Zubrowka Vodka and 50ml apple juice. Shake, add the rest of the ice and mint sprig to garnish. A Mexican Mojito uses the Mexican native tequila instead of rum as a primary alcohol, and simple syrup instead of sugar for a sweetener. A 'Dirty Mojito' uses spiced rum, brown sugar syrup, key limes, crushed mint, and soda. A Mojito without alcohol is called "Virgin Mojito". An 'Apple Mojito' uses apple-flavoured liqueur as well as rum.